Niyati thinks about some way to distract the cluster of bat, as they can hear not see. Inside, Akshat tells Dr. Drusht what he watches engraved in his memory. He says there are wedding preparations going on. Pandit ji sent sindoor and mangal sooter. He at once spot Kanchan under the veil. Dr. Drusht tells Akshat to keep an eye over Kanchan. Akshat follows. Niyati takes the bat into the house of the old woman. She herself was hiding beneath a clothed table. Akshat says Kanchan is heading towards Niyati’s room. She comes to Suhag belongings. Niyati cautiously moves towards the door, and locks the bat inside the house. There, Kanchan was furious that Niyati was saved once again. She can’t let Niyati celebrate defeating death. Sumati returns to Jalsa and watches Niyati enter the house. Sumati thinks Niyati was unwell, what she was doing outside so late. Niyati hears Dr. Drusht inquire Akshat what Kanchan is doing in Niyati’s room. Sumati enters the house. Akshat forced his mind. Niyati stuffs Sumati’s mouth before she could speak a word and interrupt. It was dawn, they were running out of time. Akshat says Kanchan is throwing black powder over sindoor, mangal sooter and every other thing. Dr. Drusht turns around and says this Tantra is over her Suhaag’s symbols Niyati. Sumati was also shocked the hear all this. Dr. Drusht now removes the equipment from Akshat’s face. Akshat wakes up and stands for Sumati. Niyati hugs Akshat. Sumati asks Tantra? She already sensed there was something wrong, she asks what is happening and who this man is. Niyati tells Sumati about the odd behavior of Akshat, his attacks over her life in the farm house and his wild behavior. The forest encounter and his attempt to take her life. Sumati fell back on the couch and complains that they didn’t share anything with her, can they handle everything all alone. Niyati holds Sumati’s hand and says she didn’t know as well. She came to know about it in farm house. She and Akshat apologize Sumati who hugs them in tears. She was weepy that they had to suffer a lot. Dr. Drusht interferes that they still need to find an answer. This Tantra is the most dangerous, it will take control of her husband so that he ruins everything. Dr. Drusht says Sumati must have heard that one must never share one’s bridal belongings even dress with anyone to protect them from Tantra. Sumati asks him about some solution. Dr. Drusht says there is a way, but it won’t be easy. Niyati must take off her Mangal sooter, and sindoor. Niyati wasn’t ready and asks how this can happen. Sumati says Dr. Drusht must have said it thoughtfully. They have no other way to save Akshat. Akshat nods at Niyati. Dr. Drusht gives Niyati a bag so that she hands everything over to him in the bag. Niyati comes in front of the mirror. In tears, she removes her bangles. Akshat comes to help her take off the mangal sooter. He says he has hurt her a lot, today he promise to share every problem with her. He takes Niyati’s hand as they pull off the mangal sooter. PRECAP: In the jail, Kanchan tells Niyati she has put Akshat’s life in danger by removing her Suhaag’s symbols. Niyati boasts that devil has never won in life. Outside the police station, Niyati hurries home. Akshat was unwell, and puked blood. 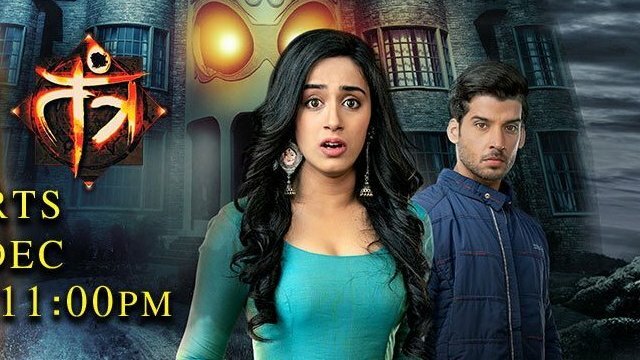 The post Tantra 5th March 2019 Written Episode Update: Tantra’s roots detected appeared first on Telly Updates.